My late uncle who farmed wheat when he wasn’t jumping out of perfectly good airplanes in the dark to kill the enemy always used to kid me with “How much food did you grow this year?”. I admit it. I’m a much better consumer of food than a producer, but last year I actually bought seeds of millet, wheat, oats and barley and had a little plot of each in my garden. I was quite proud that I actually grew some food, or rather, some more seed for this year. Unfortunately, the millet met with misadventure, my rototiller, when I forgot where the weeds ended and the millet began. I actually lost the harvest of wheat somehow. I just don’t know how. I had a handful of oats and barley to plant this spring. 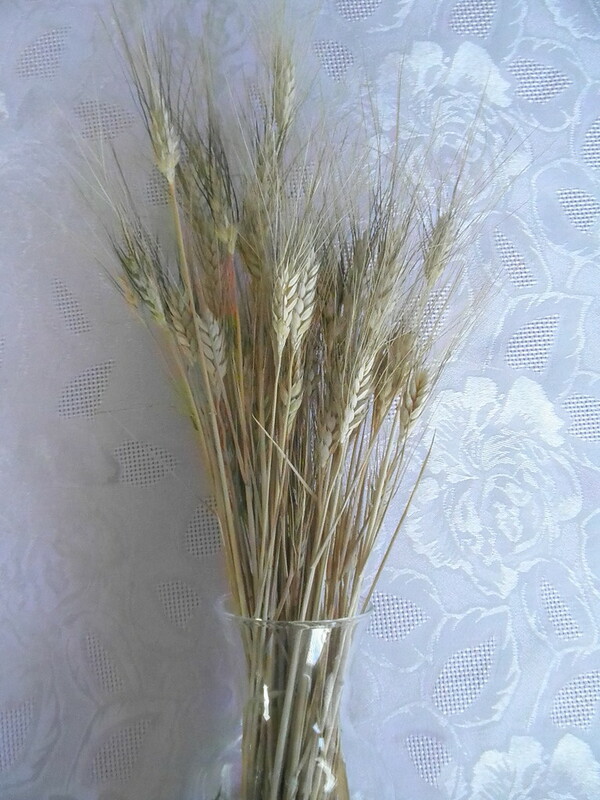 They were killed off by the drought and the weeds… I did find three heads of wheat which somehow escaped my “harvesting”. I had placed them on my dresser on the top of the pile… These I carefully threshed and planted in three large pots with good soil. I watered them. I weeded them. They grew and produced the abundance seen on the right. So, there it is. I grew some real food and I will not lose them this time. They are in a vase which shall be prominently displayed in my living room and defended against grand children, women, and anyone who does not respect a man and his harvest. I will plant this seed in a good plot next year and maybe make enough flour for a few tea-biscuits. Look out after that. I will corner the market and become self-sufficient in wheat, Lord willing. This entry was posted in food, horticulture, weather and tagged food, garden, security. Bookmark the permalink.